One of the things that I love the most about the military is that it exposes you to traditions that you never would have stumbled upon without it. For me, one of those traditions is celebrating the Kentucky Derby on the first Saturday in May. When I was young, my family was stationed at Ft. Knox, Kentucky where we were invited to our very first Kentucky Derby party. My mom immediately fell in love with the Derby - the food and drinks and the traditions that surround the “Run for the Roses.” Entertainer and hostess that she is, she adopted it as her own and has had her own party every year since our departure from Kentucky almost 20 years ago. Derby Day has since become a holiday of sorts that I recognize after all this time and I’d like to share my favorite part of our Kentucky Derby tradition with you – the food. Ladies, don your hats and pearls. Gentlemen tie those bowties. Grab some bourbon and indulge in some made-from-scratch Southern fare while cheering on the ponies. Go, baby, go! Finely grate cucumber into a pulp. Place in a piece of cheesecloth or paper towel and press out juice until pulp is fairly dry. In a mixing bowl, mash cheese with a fork. Work cucumber pulp into cheese. Add onion, salt, and Tabasco sauce. Add just enough mayonnaise to make a smooth, easy-to-spread filling. Serve on bread as tea sandwiches or with crackers and vegetables as a dip. Preheat oven to 250 F. Line baking sheet with parchment paper and spread pecans on top in a single layer. Bake for 15 minutes. Meanwhile, melt butter in a medium saucepan over medium heat. The butter will begin to bubble and foam. Stir regularly. The foam will subside as the butter begins to turn brown and have a slight nutty aroma. Be patient as it takes a little while to brown but watch carefully because it can also burn easily. Once it is browned, remove from heat immediately. When pecans are done baking, add to the browned butter with maple syrup and rosemary. Put pecans back on baking sheet in a single layer. Sprinkle with salt and bake another 5-10 minutes. Make dressing by whisking together first four ingredients. Put in refrigerator to chill until ready to use – preferably at least one hour. Melt butter in small saucepan. Add walnuts and sauté for five minutes. Drain on paper towel. In a large bowl mix together walnuts, lettuce, asparagus tips, and pear. Sprinkle salad with blue cheese and cranberries and top with dressing. In a medium saucepan, melt butter and sauté onions. Add flour and whisk thoroughly to create a roux. Slowly whisk in milk, stirring constantly to avoid burning. Once milk is incorporated add cayenne, salt, and pepper. Simmer for about 20 minutes until sauce is thick and creamy, stirring often. Meanwhile, toast bread and spread in a single layer on a broil-safe baking sheet. 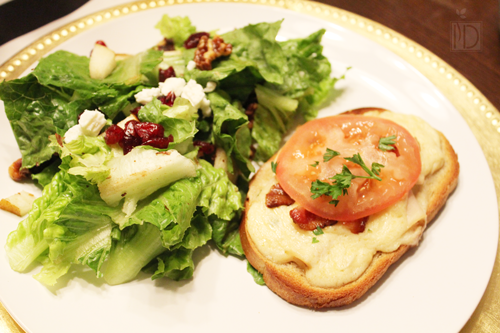 When sauce is complete, assemble Hot Browns by spreading a spoonful of sauce on bread. Top with turkey. Then cover with sauce and sprinkle just a bit of Parmesan cheese on top. Stick under the broiler until golden brown. Watch carefully as the Hot Browns can burn easily. Remove from broiler and top with bacon, a slice of tomato, and a sprinkle of fresh parsley. 1. Put all ingredients in a pot and bring to a boil. Stir so that all sugar dissolves. 2. Remove from heat, cover, and let sit at least two hours. The longer the syrup sits the stronger the mint flavor will be. Use the simple syrup to create Mint Juleps or Sweet Mint Iced Tea. Mix all ingredients in a silver mint julep glass with ice. Mix syrup and tea in a glass with ice. Garnish with fresh mint leaves. What traditions from other regions or countries have you picked up during your travels with the military?